So called industry experts never fail to use every opportunity to convince us that we absolutely positively need the plethora of every inconceivable beauty products ever created in order to look younger, more radiant and achieve a flawless complexion. The majority of us have probably spent thousands of dollars in our lifetime trying various potions or magical elixirs which contain dubious and indecipherable chemicals that purport to solve all our skincare issues. After all, these products were "invented" using fancy schmancy scientific experiments and undergone "rigorous" testings so they know what they're talking about. Right? Being a mother has made me more careful about the food I eat and the stuff I pile on my face. Funnily enough, I'm healthier and my skin's looking better using a more simplistic and natural approach. Natural skincare is more readily available these days but do you know that you can make them right at home with very little outlay? Here's my favorite girl, Laura who will talk about this in more detail. As much as I love luxurious designer goods, one place they don’t exist is in my skin care cabinet. Over the years, I have tried it all - Chanel Sublimage, anything and everything from Kiehl’s, anything and everything from Lancome, Oil of Olay, Clinique, Shu Uemura, Mary Kay, a few lines from some doctors, Caudalie and so on. But now, I’m done. Yup! None of this stuff goes anywhere near my skin anymore. Now, I’m not talking about makeup - I still wear Chanel and YSL cosmetics but when it comes to skin care (the stuff closest to my pores,) I’ve gone completely clean, using a myriad of things that grow naturally and are not created in labs. My skin has never been better, my routine has never been easier and my wallet has never been happier - leaving, of course, more money for things that go in my closet! In my experience, the products that are supposed to be miracle workers have left my skin tired, dull, break-out prone and just plain confused! And who knows what those chemicals have done inside my system, where I can’t see it? It bugs me when some companies appear to be oh so natural, but their ingredient labels read like a toxic lab nightmare! I’ve decided that I shouldn’t have to have mineral oil in my products. I shouldn’t have to have sulfates, parabens, artificial fragrances or artificial colors in my products. And now, I don’t. ...to this! Everything that goes on my face now. Homemade toner, serum and oil cleanser. 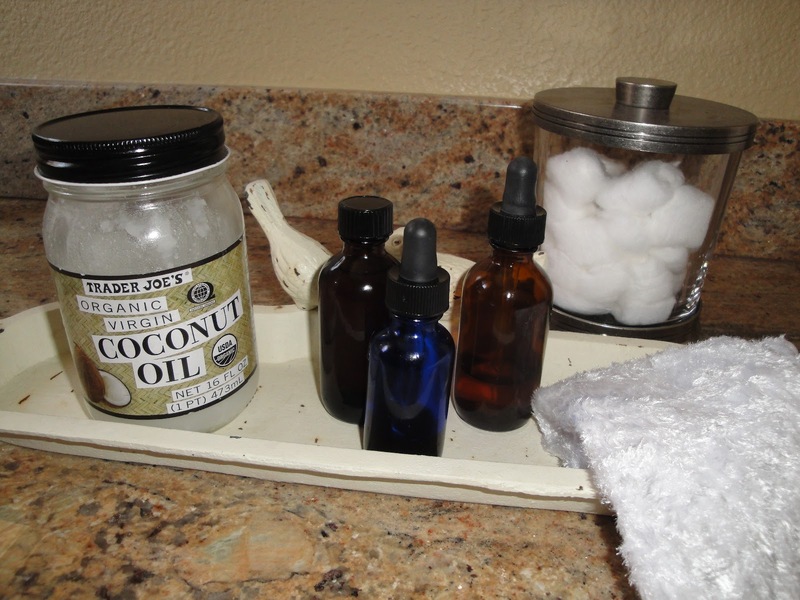 Coconut oil to remove eye makeup and condition eyelashes. Now, there are many companies that make beautiful, natural skin care lines that are free from the things (and many others) that I listed above. They do a great job and it’s nice to have a few of these lying around too! But over the next few weeks, I’m going to show you how easy it is to make your own products if you choose to do so. Again - more money for shoes! Let’s start with serum, because Marlene is really interested in this one. Friend, I’ve got you covered! I no longer use moisturizers on my face. I use one serum twice a day that combats aging, breakouts, dry spots, age spots, sun damage and whatever else is going on with me! My serum is based on essential oils. These are the same oils that are found in those expensive brands - but in those cases, they’re unfortunately surrounded by all sorts of fillers that we just don’t need. It’s the fillers and artificial fragrances (and pretty labels) we’re paying for. The great thing about using these oils is that you can change your serum based on whatever your skin is doing. Is it winter and your skin is more dry and blotchy? Adjust your serum by adding a bit of the more emollient avocado carrier oil to your usual carrier oil(more on how to do this in a bit). Are you suddenly noticing a few sun spots after your trip to Hawaii? cough, cough - moi. Well, add a few drops of frankincense in there! By the way, as I’m typing this, I’m noticing that those pesky spots are fading fast! I got the idea to do this when I read about Linda Rodin in Vogue. 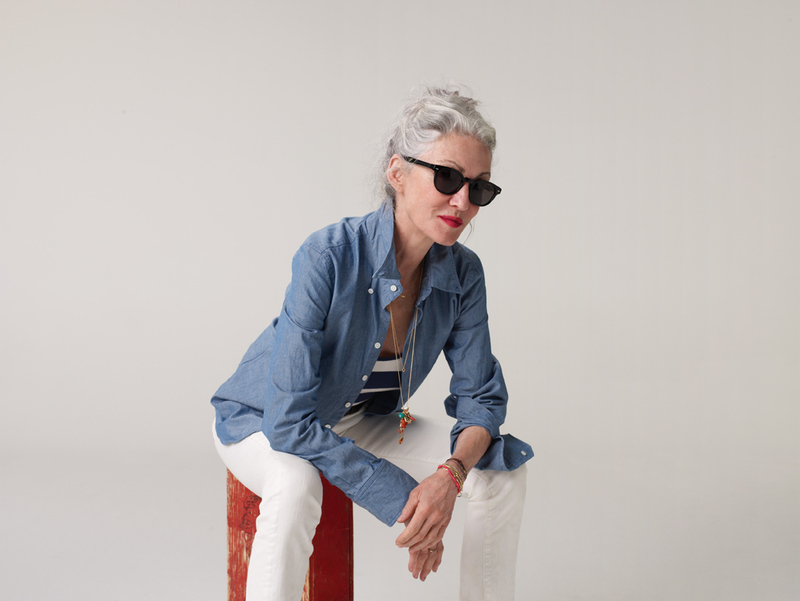 Who is Linda Rodin? She’s a New York socialite and former model who felt the same way I do. She got tired of the skin care hype, decided that natural was best and experimented in her kitchen with essential oils. After a few attempts, she came up with a serum that worked like nothing she’d ever tried before. She loved it so much, she began giving it as gifts to close friends. As with anything good and extra special, word spread and people began hounding her for the recipe. She created a company and now sells her serum online and in fine establishments. 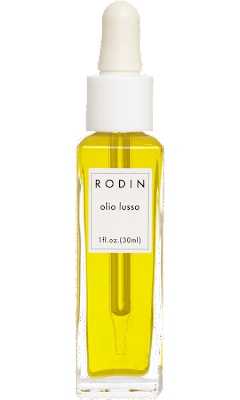 She calls it Olio Lusso. I’ve heard it’s downright magical! And completely pure and clean. But....it’s expensive! It runs around $150 for a small bottle. Now, can I afford this? Yes. Would I pay $150 for something non chemical based that actually works and would really change my skin? Absolutely. And I almost did! I told my friend (who also makes her own everything) and we decided to maybe buy one bottle and split it. Check it out. See how it works. At my house one day, we put our detective caps on (Chanel, of course...) and found out a list of the ingredients. It’s basically a couple of good carrier oils and a list of 11 essential oils. That’s it. “Can’t we just buy these oils ourselves and make our own?” she asked. Yes we can. And we did! And even better, we did our homework and found a couple of websites that tell you exactly how to do this. 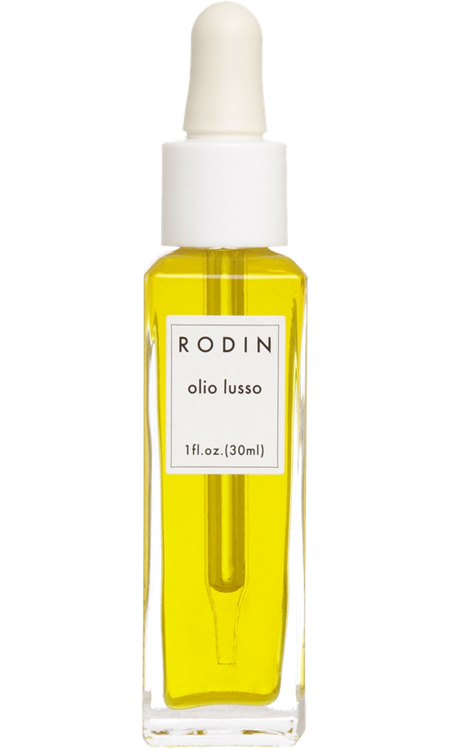 And unlike Linda’s Oilo Lusso, our serums have only what we need for our individual skin issues. There were a couple of things in Linda’s that are not right for my combination skin. There were others not right for my friend’s oily skin. But now, our serums are exactly right for us. So, how much did I spend? My initial investment was about $50. That was for a bottle of my carrier oil of choice - Jojoba oil, and for about 4 starter essential oils from Aura Cacia that I mix in. I also use these oils in other ways all around my house - from combating colds and making body scrubs to adding them to cleaning products, I really get my money’s worth out of them. I also bought a one ounce dark colored glass apothecary bottle with a dropper top to store it in. This is a must-do. Mine was $1.99 at my local health food store. My One Ounce glass bottle with dropper top. It only took 1/3 the amount of the carrier oil and only about 2-4 teeny drops each of my chosen essential oils to complete one bottle of my serum. You do the math! I have months worth of product to make batch after batch! More money for Isabel Marant! Fill a 1oz. amber/dark glass tinted bottle about halfway with my carrier oil(s). I’m using jojoba oil right now. Fill up the remaining space with the carrier oil. Apply 4-6 drops of serum in the morning under makeup and in the evening after cleansing. Warning, depending on what you’re using, the smell of the oils combined might be strange! But it only lasts a few minutes. Promise!!! Commercial products add all sorts of stuff (that I don’t want) to combat this. Personally, I’d much rather deal with less than 2 minutes of the essential oil fragrance than having artificial ingredients. Total time to make this? Less than five minutes. It takes longer to drive to the store to buy a pre-made product. What’s the difference between a carrier and an essential oil? You may ask this and more, as I did. I used the information on the site below to make my serum. This site gives you the proper ratios to use of all of the oils. 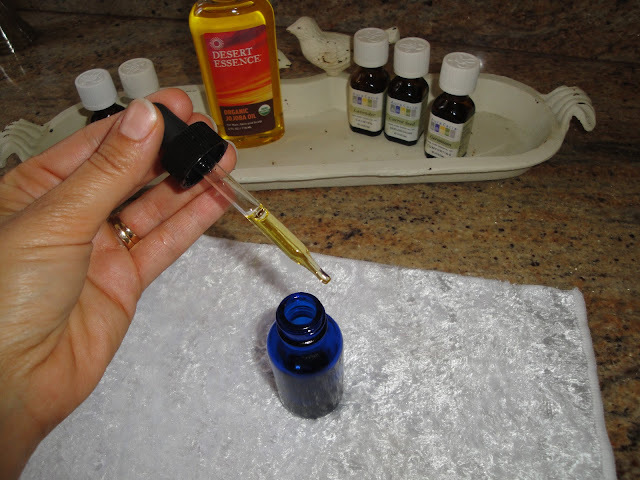 Be sure to check out the various tabs that talk about the properties of the oils and how to combine them safely. There are also other recipes for toners and oil cleansers that you can eventually work up to making if you choose. Here's my favorite skin care site! If any of you give this a whirl, I would love to hear about it! Happy skin! A HUGE thank you to Laura for putting this together. A lot of research, time and effort have gone into this post. Thank you, Laura!! This is fantastic, I never use moisturiser, I just slap on sun block in the morning ad that's it, if I have any dry patches I rub in some aquaphor. I do splash out on Lancome's non oily eye make up remover, it's the only one I've found that doesn't irritate my eyes. HUGE thank you for this! I was looking to make some sort of serum to replace the moisturizer that I've been using (but that I hate). I've tried a couple facial oils in the past, but it does seem like we all need one tailored to our skin. Brilliant! You are so welcome! I've tried pre made facial oils too and some of them use Mineral Oil, which makes me break out. I have never heard of this one~ it looks awesome, and im pretty sure you look fantastic ;))))) xO! Thanks! I was afraid of that, too. Conversely, using the right oils will control those breakouts. The site I posted will really steer you in the right direction. I hardly ever get breakouts anymore. Best of luck! thanks so much for this post! i'm very keen to switch to natural products, and if i can make my own that's even better! i can't wait to hear about natural cleansers, my skin seems to be getting more sensitive as i get older and i haven't found a cleanser that works for me in a long time. The same site we posted that deals with the serum has a recipe for an oil cleanser that is so easy to make and fantastic. I've been using it for about a week and I'll never go back to soaps! Wow. Amazed and intrigued. Thank you Laura! Such a fantastic post!! My entire hair care and skin care routine is completely organic/natural/herbal etc. etc. but I recently started really looking at what each ingredient does and the research has really helped me out in picking and choosing what I put on my skin. This post has inspired me to customize a serum for my skin type! :D I already have a big ol' bottle of jojoba oil so I just need to get some essential oils. I was also super duper close to purchasing Rodin's face oil but then stumbled on some other smaller organic brands that are muuuch less expensive! That's great! 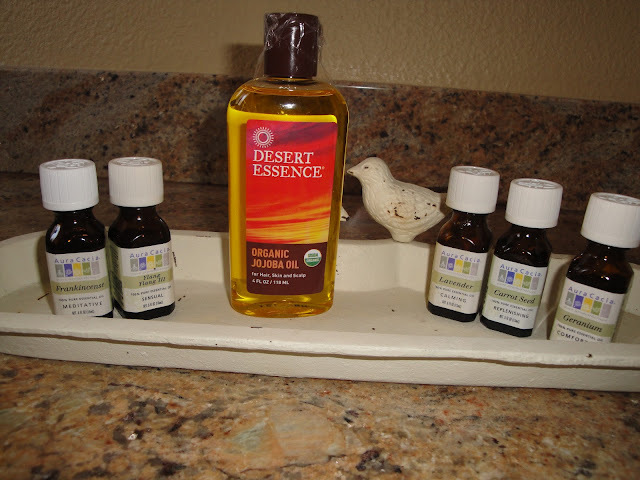 Jojoba is a wonderful carrier oil for most skin types and it's inexpensive. Let us know how it works for you! An excellent post Laura! I too have found that the more I put on my skin, the more irritated it gets. I used a very expensive regime of products leading up to my wedding 5 years ago. After 9 months of use and thankfully AFTER my wedding, I reacted all over my face and neck. I asked around and found that many people had also knew of people reacting to this brand after a similar time period. Yuk. I find the less I put on my face, the happier it is. My biggest challenge remaining is my allergy to sunscreen. I am yet to find a solution to this and with summer approaching again I'm keeping my eyes out for any successes others have had. Wonderful post! Thank you Laura and Marlene for sharing this!!! I've been trying to switch my skincare routine to more natural products and I really like the idea of how this serum can be adjusted to address the specific needs of one's skin. Thanks to Laura and Marlene for sharing this! 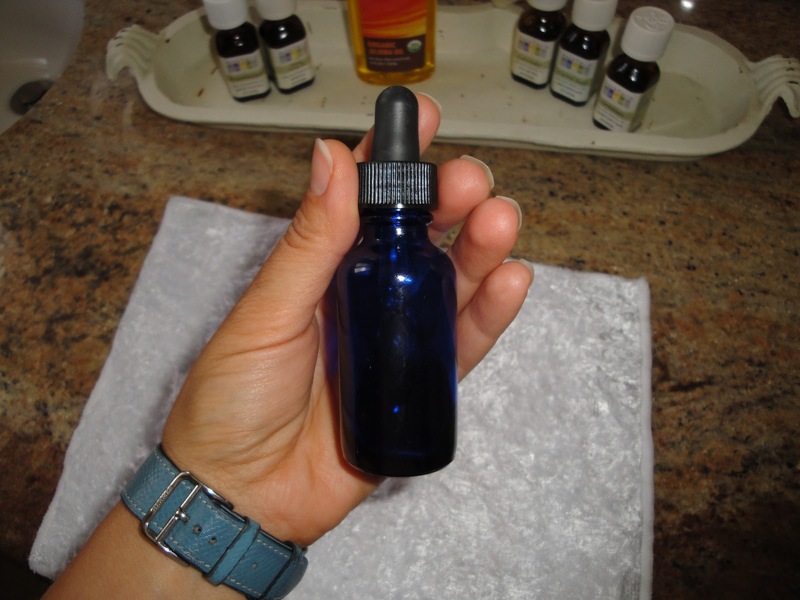 Between rosehip oil and this home-made serum tailored for your skin type, did you note any difference? And Marlene, I ordered the Ren AHA and boy, I was impressed! I'll chime in - Straight rosehip oil is not quite right for my skin but I'm going to use it as a 10% add on to my usual carrier oil in the next batch of serum I make. Rosehip oil is miraculous for wrinkles!! Thanks Laura! 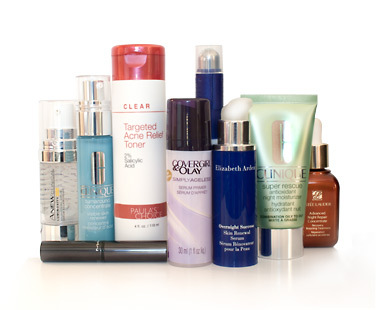 Do you know what oil is good for oily skin with pigmentation? Keep it for your body - the best! I'm going to do a post on coconut oil soon. Good luck! Fantastic! Let us know how it works for you! wow what a fantastic post. I really want to try this but I know I will never get round to doing it! I'm fascinated by the Rodin thing, shows what an utter rip off it all is and we all buy into it. I'm struggling to let go of all the pretty packaging though.